Saab 96 V4 Rally 1969 in original racing colors in the 1970s. 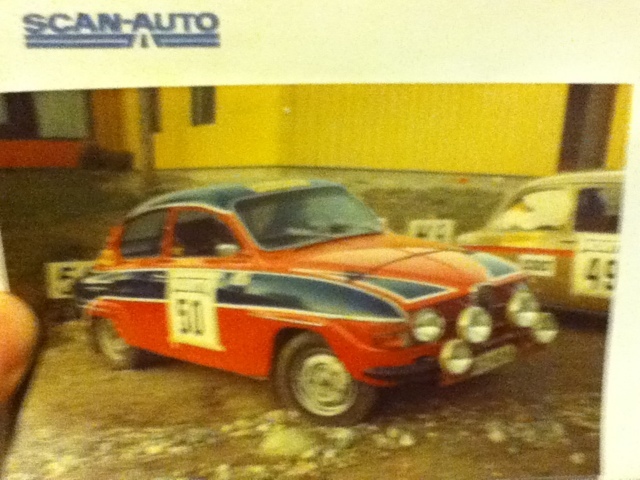 This is my 1969 Saab 96 Rally car. It came to me in bad shape, mostly gutted, but I decided to rebuild it to use it as track day car. Maybe I will even take part in some hobbyist race some day. This car has some documented rallying history from the 1970’s. The car has now been fully rebuild with a 1800 cc engine, new Ford SOHC/Pinto pistons, cross-flow intake manifold with twin Weber 40 DCOE carburetors. Gearbox is “folk race” variant, with long 1st and 2nd gears. Full Mexico brackets and sump guard. Exhausts are routed rear of the engine compartment. Also full safety cage and racing seats and belts. Electronic fuel pump. Suspension has also been hardened. Saab 96 V4 Rally – First start! Saab 96 V4 Rally – engine build part 3. Saab 96 V4 Rally – engine build part 1. Saab V4 Rally – working on the exhaust system, done! Impressing rebuild.Nice colors. Same as Gulf-oilcompany. You have really done some great work on the v-4. I have owned and driven SAAB cars since the early 60’s GT 750′ to currently two Sonnett III’s. Looking for a V-4 96 to buy or a 93 body , whole car any condition.